I’m all about Well Fed Weeknights right now (out November 1!) 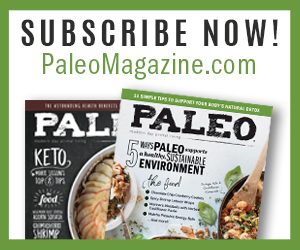 but this is the season when everyone releases their new books, so I’m going to highlight some of the awesome new options in the paleo world. 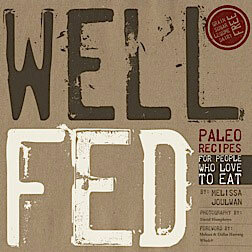 Today, I’m sharing a look inside a book I truly love: Simone Millers’s new cookbook Paleo Soups & Stews. I’ve been a fan of Simone’s recipes for ages, and I adored her last cookbook The New Yiddish Kitchen (my rave review here). 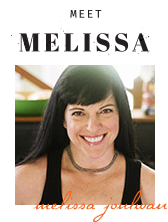 So when she asked me to write the foreword for Paleo Soups & Stews, I said yes immediately. This new book is packed cover to cover with heart, cooking wisdom, and very delicious, always reliable recipes. To understand why I think Simone is a best-quality human, you have to know something about me first: I’m a serious introvert. Back in 2011, I attended the Paleo f(x) conference in Austin, Texas for the first time. I was a new cookbook author, and I was both delighted and overwhelmed to find myself in a room full of paleo practitioners. Everyone was there! 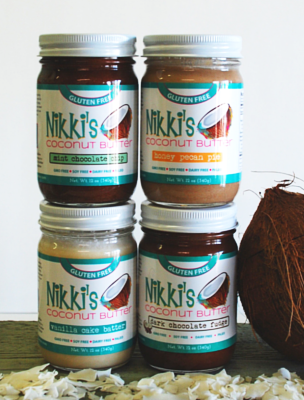 The researchers, the lifestyle gurus, the ripped fitness geeks, the bloggers… and me. So there I stood, trying to figure out how to mingle—is there anything worse for introverts than mingling? !—when I found myself talking with Simone. I’m not sure if we were introduced by mutual friends or spontaneously started to chat, but I was smitten with her immediately. She’s funny and kind, with plenty of backbone, a quick laugh, and a generous spirit. Those are all characteristics you’ll find familiar if you’ve cooked any of the wonderful recipes to be found on her Zenbelly blog or in her previous cookbooks. Her food and writing authentically capture who she is in real life—an irresistible blend of sophistication, earthiness, and enthusiasm for food, life, and food-life. 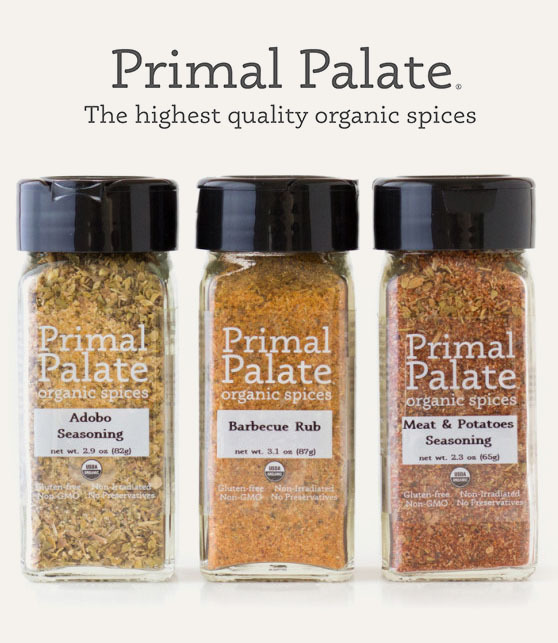 In her first book The Zenbelly Cookbook, Simone gave us the first truly high-end paleo recipe collection, proving that quality ingredients will always deliver first-class flavor. WithThe New Yiddish Kitchen, she and her co-author Jennifer Robins invited us into their Bubbe’s kitchens—and put bagels, cream cheese, and kugel back on the menu. I think we can all agree the only thing more comforting than a bagel with schmear, is a bubbling pot of soup. But you will probably also concur that rich, hearty, velvety, sippable potions and stews are rare in the paleo world. The ingredients traditionally used to produce those silky textures—namely, heavy cream and flour—are verboten for most of us following the paleo template. Let’s also pause for a moment to mourn the loss of the go-alongs that can make soups something special: crusty bread for dipping, tender noodles for slurping, crackers and croutons for a crispy contrast. Enter Simone’s experience and creativity. She’s cracked the code on inventive ways to make hearty and silky soups that honor the nutrient density of the paleo framework. And her breadsticks, crackers, noodles, and cashew yogurt? They’re not “good for paleo,” they’re good. Or, to be more accurate: Good, with a capital G.
Simone’s recipes set the bar for paleo cookbook authors, and she continues to demonstrate that the “restrictions” of paleo aren’t limitations at all. 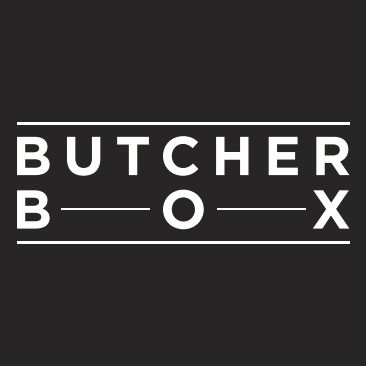 They’re a call to be creative, to embrace the joy inherent in food, and to nourish ourselves with the bold flavor of quality ingredients. I’m grateful I met Simone in that crowded room, and I’m filled with affection for her and her recipes. I wish we saw each other more often, but when I cook her food, it’s like a lovely visit with her, just hanging in the kitchen. Her presence on the page is as comforting as a bowl of her luxurious Chicken & Dumpling Soup, and just as welcome. I am bad at making soup without a recipe. My mom is the master of throwing together ingredients that turn into magical potions. But me? I need detailed instructions. 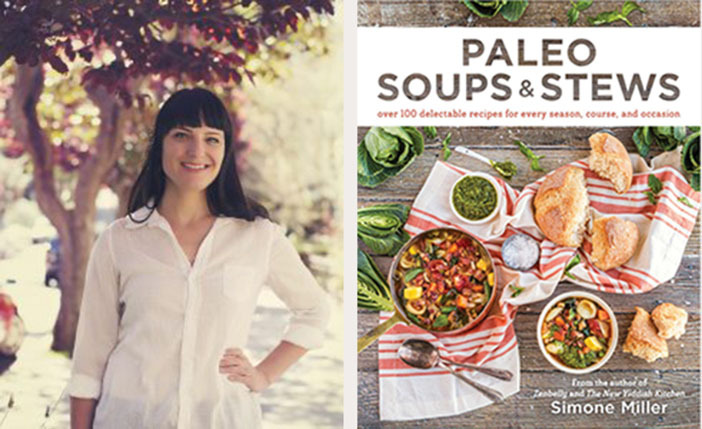 Thankfully, Simone’s new book provides dozens of luscious recipes, but she’s also included a very helpful primer on soup-making technique, how to season soups and stews properly, and equipment and storage tips. In addition to comforting recipes like Thai Pumpkin soup, Orange and Olive Beef Stew, Sweet and Sour Cabbage Soup, and Moroccan Vegetable Stew, there are the all-important go-alongs that turn soup into a meal. I’m talking about treats like paleo-friendly crackers (Oyster crackers! Garlic and Chive Crackers! Seeded Crackers! ), Plaintain Tortillas, Drop Biscuits, Rye Bread, Baguette, and more. She’s even included innovative dessert soups. (Hello, Chocolate Soup!) This cookbook is page after page of inspiration—and all the recipes are easy to follow, even if you’re not a kitchen pro. 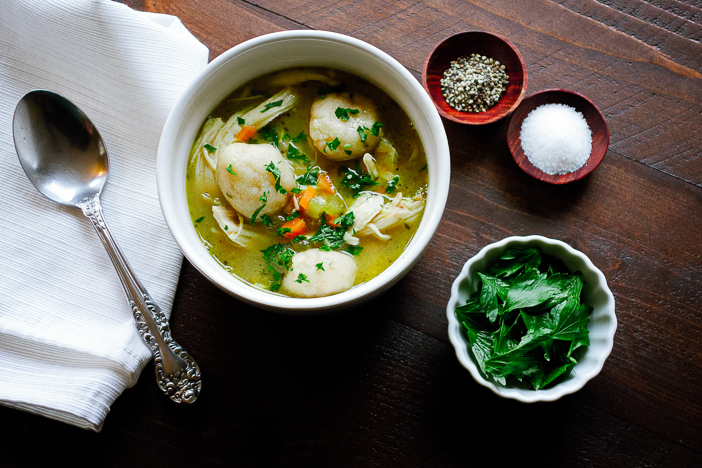 Simone was kind enough to let me share a recipe from the book, and I chose Chicken & Dumpling soup. My mom’s dumplings are like little chewy clouds floating in sunshine broth. This recipe is a close second. In a large bowl, whisk together the arrowroot starch, salt, and pepper. Dredge the chicken pieces in the mixture, coating them on all sides. In a large heavy-bottomed pot, heat the ghee. When hot, add the chicken in batches and cook until golden brown on all sides, 4 to 5 minutes per side. Remove the chicken and set aside. Add the onion, celery, and carrots to the pot and sauté for 5 to 7 minutes, until the veggies have softened. Stir the thyme and turmeric into the vegetables. Pour in the broth, scraping up any browned bits that are stuck to the bottom of the pot. Return the chicken to the pot and bring to a simmer. Simmer the soup until the chicken is cooked through, about 20 minutes. Remove the chicken pieces and set them aside to cool. While the soup is simmering, make the dumplings: Mix together the almond flour, cassava flour, baking soda, salt, and coconut milk. Use your hands to form the dough into 24 small dumplings. The dumplings should be somewhat round but still rustic looking. Drop the dumplings into the simmering soup and cook for 5 minutes. Add the shredded chicken and coconut milk to the soup and simmer for another 3 to 4 minutes, until heated through. Garnish with fresh parsley or chives, if desired. After completing Step 4, transfer the contents of the pot to a slow cooker and add the chicken. Cook on low for 8 to 10 hours, until the chicken is cooked through. Remove the chicken pieces from the pot and allow to cool. Complete Step 6, then turn the heat up to high and add the dumplings to the slow cooker, allowing them to cook for 20 minutes, or until they’re cooked through. Proceed with Steps 8 and 9, cooking the soup for about 10 minutes to heat through. 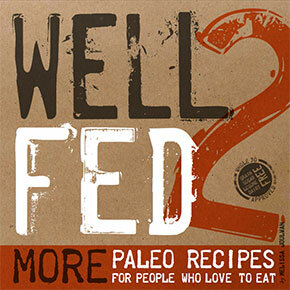 Paleo Soups & Stews is on sale now! Hey Melissa! I just received notification that my Well Fed Weeknights is on it’s way and I ordered Simone’s Soup book as well. I am looking forward to a winter of yummy food. It will be my third Well Fed cookbook and my third Simone cookbook. I am a little obsessed! This is an obsession I like! Simone’s soups will see you through winter very happily! I hope you love the new Well Fed Weeknights recipes. Thank you for pre-ordering! I received Well Fed Weeknights today! I cant wait to go through it and make some great meals! It is filled with so much great information before the recipes begin. Love that! Awesome! I’m glad it arrived and hope you have a wonderful time trying out some new recipes. Happy cooking! I just got my Well Fed Weeknights cookbook. I love to mark the recipes that really inspire me. I got about 100 pages into the new cookbook realizing that I had marked every page. Dang! So my new plan is just to leave it beside where I eat breakfast and plan 4-5 days worth of meals at a time. I love your other cookbooks, and judging by my ‘so-far’ marked pages, I think as am going to love this one too! Thank you! This is just the sweetest comment EVER. I love that! Thank you so much for letting me know you’re excited about the new recipes. Have fun playing in the kitchen! Hi Melissa! Can you sub tapioca for cassava? And/or do you have a link for a preferred cassava flour? I tried tapioca instead of cassava, and the dumpling batter was way too runny. So I added extra almond flour, extra tapioca, and eventually added coconut flour too.. end result held together but the soup became very cloudy and thickened as the dumplings shed a bit. Not quite the success I was hoping for – I presume the cassava flour works better. Ok, I just tasted mine….for the 10th time! IT is STILL good and now I know where to get Cassava flour! IT’s ALL good (and so is my chicken and dumplings)! I am confused…I checked the internet and it says that cassava and tapioca flour were the SAME…and I am in the process of making this now and I used cassava! Help! I will post the results here but so far, it looks good, I did notice that the dough was kind of runny, so I originally came here to ask how to form these balls! I guess that answers my question in a roundabout way! It should NOT be runny eh? it should be kind of thick enough to form a ball? Oops! It’s a little confusing… tapioca starch and cassava flour both come from the same source—cassava root—but tapioca starch is a very fine powder with thickening properties, but not real structure. Cassava flour is coarser and has more structure, so it works better for baked goods and things like these dumplings. 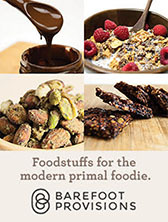 And I also appreciate a cookbook that doesn’t rely on 50+ paleofied treats to sell. I also received my copy of Well Fed Weeknights today. Can’t wait to start cooking! I also really enjoyed your Facebook videos. I was thrilled to see Smudge strolling in the background. YAY! Thank you for pre-ordering! Glad it arrived so you can start cooking the new recipes. And thanks for tuning into FB Live. That Smudge! She’s a cutie, right?! I am waiting for my 2 books – one an Xmas gift for my daughter and the other of course for me. Your first book was a gift from my daughter – the second book I got for us and this one as well. To say we are great fans and admire what you do would be an understatement! I am looking forward to exploring all the new recipes and trying them all! One other comment I think needs to be said – first this is the only time I have ever comment on anything anywhere – but what I love most about your site and the emails I get is that you don’t keeping hitting folks over the head to promote things – I realize it helps keep the site going but you say in a great way what you need to and move on and share with us tons of valuable information and recipes. The day my daughter introduced me to you and your site…was the best and I continue to follow. Thanks for doing all you do! Well, you are awesome for ordering two copies. And I’m honored that you commented on my blog 🙂 Thank you! We really appreciate the support, and I love that you’ve been gifting Well Fed books back and forth. Fantastic! Please keep me posted on how you’re doing from time to time. I love to get updates! This looks delicious. My daughter has a coconut allergy. Could a different milk be substituted for the Coconut milk in both the soup and the dumplings? I think you could probably use almond milk, but it’s not my recipe, so I’m guessing 🙂 If dairy is ok, you could probably use a little yogurt for the soup itself and almond milk for the dumplings. I suspect you could also use water or broth for the dumplings and omit anything creamy for the soup. It will still taste delicious. Great. I wondered because canned coconut is very thick. Unlike Almond milk. But I will definitely give it a try! Thank you! I made this soup last week and wondered if it would be worth the work of browning the chicken pieces… it was absolutely delicious. I was pleasantly surprised by how easy the dumplings were to make and they were so yummy. It did take me a long time to brown all the pieces of an entire chicken, though, and I am wondering if you can just skip this step and just cook the chicken pieces entirely in the broth for a longer time period. The browning really adds to the flavor in the soup. You *can* skip that step, but the flavor of the stock will be less deep and rich. According to Cook’s Illustrated, you can get away with browning just half the meat, so next time, you might try that. Brown half of it and just plonk in the rest of it, and see how you like it. I tried the dumplings portion of the recipe and was pleasantly surprised at how well they held up. The texture was a little mushy upon eating, but it was nice to eat a dumpling again after being pale for some time! I did add part of an egg to the dumpling recipe because I thought it’d help bind them a little better.